Price for ADULTS: $35.00 | STUDENTS: $30.00. Pickup: 8:00, 10:30, 12:30, 2:00 p.m. | Duration: 2 hours. Students maximum 18 years old. 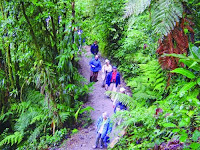 Selvatura Cloud Forest Tree Top simply the best way to observe the Cloud Forest Canopy with the advantage of being able to take your time to observe each of the forest levels. This tour may be taken either guided or self guided. Different fees apply for guided and non-guided tours. 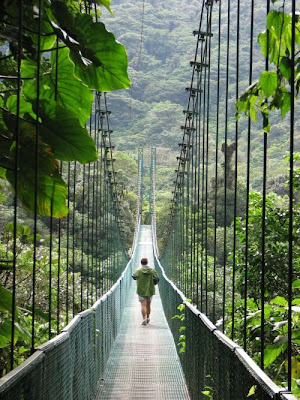 Combine the Tree Top Walkways with the Selvatura Canopy tour for only... Adult & Students:$70. 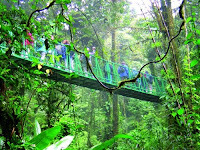 Selvatura's Treetop Walkways is a 1.9 mile (approximately 3 kilometer)trail that crosses through the cloud forest, in which our visitors will walk through eight different bridges from various lengths ranging between 150 feet ( 50 meters ) up to 510 feet ( 170 meters ) and altitudes ranging between 36 feet ( 12 meters ) up to 180 feet ( 60 meters ). Each of the bridges feature a five foot width, the widest ones in the country, and also a capacity of up to 80 people per bridge making them both the longest and strongest bridge system in Costa Rica. 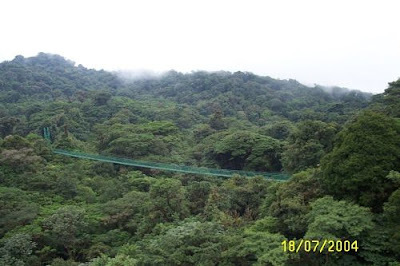 The treetop walkways are suitable for people of all ages and physical condition. Guided and self guided tours may be booked in advance, and the duration of the tour is usually between 1.5 and 2 hours.